From Temple 43 to Temple 44, the distance is about 80 kilometers, depending on which route you choose to walk on. Since we walk an average of 25 kilometers per day, we divided this distance into three days, and planned to stay at the foot of the mountain-top temple 44 on our fourth day. The first night we slept in Ozu City, the second in Uchiko City, and the third we will stay in Oda Village, on our way to Kuma Town at the foot of Daihōji, Temple 44. Our guesthouse in Ozu City was clean and comfortable. It is run by a young couple with three beautiful kids, who open their house to traveling pilgrims. Because they are raising three young children, their schedule is pretty rigid, so we had breakfast at 6:30 in the morning, and were out walking in the rain by 7:30. It was a very early start for us since we planned to stay in Uchiko City, only about 15 kilometers away. I chose to do this, because Uchiko City has a lot to see, and I do not want to be just a pilgrim passing through beautiful places without having the time to enjoy them. Along the way, just beyond the Ozu town center, we came upon a temple that is called Toyogahashi, Bangai temple number #8. A Bangai temple is one that is not counted in the original 88 temples pilgrimage. Shikoku has hundreds of local Buddhist temples around the island. 20 Bangai temples were chosen and added to the pilgrimage, because they are associated with stories about Kobo Daishi, although many of them are not staffed and you do not get a stamp for your pilgrimage book if you visit. This Bangai temple is located near the bridge that Kobo Daishi once slept under, when he could not find a place to sleep. This is a very well known temple, one that is fully staffed and visited by many bus loads of Henros every day. In ancient Japan, the local people used to invite wandering monks into their homes, feed them, share their Sake and offer them a place to sleep. It was believed that having a holy man under your roof, would bless your life and bring merit to your karma. But people were also wary of traveling monks. Many of them were far from being holy, taking advantage of people’s kindness and hospitality. There was a saying in old Japan, that if you do not want all of your Sake drunk or your daughter raped, do not invite a wandering monk into your house. Many of those unholy monks were just lonely men who were hungry and tired and weary of the road, and their bad reputation was unfortunately well deserved. In this case, Kobo Daishi went from house to house and was not invited in, so he slept under the bridge. A tradition developed in which passing pilgrims never allowed their staffs to bang on the ground when walking over a bridge, as not to wake up Kobo Daishi. We joked that today, it is very unlikely that Kobo Daishi would have chosen to sleep under that same bridge, with all the buses of pilgrim stopping to pray here, and all the traffic on Route 56. In a quiet village later along the way, we bought some fruit from a road stand. They had rare yellow clementines that were very delicious. A bit farther up the path, we came upon a very old shop that makes Mochi rice. Mochi is made by pounding cooked rice very fine, using a wooden mortar and pestle. The shop owner came out of his shop and called us over. He said that he wanted to give us Onigiris (rice balls), that he had just made by cooking the rice in an iron pan over an open fire. We said that we would take only one, but he said that we should have two each, and he got some plastic wrap and wrapped four Onigiris for us. While he was doing that, we took shelter in his shop from the pouring rain. He told us that he has been to Los Angeles, and that even though pounding Mochi in a huge wooden mortar and pestle is normally a two person job, he does it by himself alone. He was such a lovely and kind man. We arrived at our Ryokan in Uchiko city too early to check in. We were happy to see that we had chosen a Ryokan that was located in the historic part of town. We left them our backpacks, took our umbrellas and went to explore the beautiful old town. Uchiko City is known for its well preserved historic district that sprouted up around the vegetable-wax industry, during the Meiji period (1868-1912). Japanese vegetable wax is made from the berries of the Sumac tree. Despite the name, Japanese Sumac berries do not look similar to the better known sour Sumac that is used as a spice in the Middle East. The Japanese Sumac berries are golden in color and are much bigger. The Sumac berries are gathered by hand by pickers who climb high up into the trees. The berries are later crushed into a fine power, placed in wooden trays and bleached by the sun over several days. During those days, the trays are kept wet by sprinkling them with water dug from a well, a few times per day, using a thick hand held brush made from bamboo. On especially hot and sunny days, they must be doused with water every hour, an extremely difficult task. The white wax is later steamed in wooden bowls over an open fire. The wax was used for candles, hair oil, lipstick, other cosmetics, and for medicine. 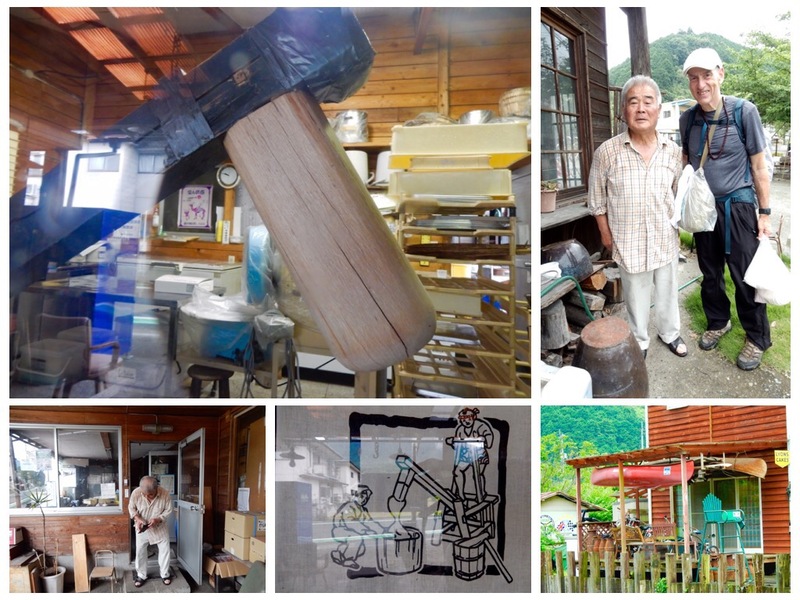 Japanese wax was exported oversees and brought much prosperity to Uchiko city. In those days, there were 23 wax merchants in Uchiko, making it the biggest wax producing town in Japan. With the development of cheaper Paraffin wax and bees wax, the profitability of vegetable wax making decreased significantly, making the labor intensive wax production process completely unfeasible. Today, there are just a handful of wax makers remaining in Japan. But the beautiful mansions of the prosperous merchants of the town of Uchiko, still remain today. Some were bought by the city, renovated and are open as educational museums. We walked the beautiful quiet streets and stopped to visit some of the museums. The Kamihaga Family and the Honhaga family residences house the wax museum, and it is a most enjoyable museum to visit with clear details about vegetable wax production (In English). The residences are a stunning example of hand made wooden architecture. The uneven beams are the size of large trees, and are fitted into one another on site, like pieces of sculpture. The museum also has a cute gift shop and a nice cafe that serves very good tea and iced coffee. We also enjoyed the “Museum of Commercial and Domestic Life,” that is housed inside an old pharmacy. The house’s spacious rooms are located around a central garden, and have a cool, flowing Feng Shui that made me want to live there forever. Scenes of daily life were enhanced by using life sized wax sculptures of people posed as they lived and worked in this house since the Edo period, when the original part of this house was first constructed (1603-1868). We had lunch at a lovely Soba Noodle restaurant that is also housed in an historical buildings. Some of these beautiful old houses are now cute shops or places to eat. The historic district is not small, and we spent hours walking around it and taking the time to enjoy it. Jules adds: “We actually ran out of time today, without having seen the fully restored theatre, or the Kite museum, with not only Japanese kites, but also kites from all over the world. It had not stopped raining all day long, and I felt SO GRATEFUL that we had the time to enjoy Uchiko, instead of making this another long day of sloshing through the rain puddles. Our Ryokan for the night is Matsuya Ryokan. The lobby and entrance do not look like much, but it is a lovely place with a small but great Ofuru that has windows overlooking the city. In the women’s baths, they also had lovely beauty products like orange-salt scrub and natural facial soaps. I felt so clean and refreshed. Jules adds: “For some reason, the men’s baths are not as well supplied with products as the women’s, not just here, but in most of the baths we’ve visited on our pilgrimage. Still, the bath was empty except for me, and that by itself is a terrific luxury, to sit and soak with no one else around. Since they gave us the option, we chose not to have dinner at the Ryokan, even though people raved about their food, and said that they serve delicious traditional Japanese dishes. I still prefer to eat a simple vegetarian meal instead of a multi course seafood feast every night. We ate a good dinner next door at Kanade Cafe. I really like our room in the Ryokan. It is exceptionally clean and well maintained, and after staying in many places that are a bit run down, it is worth mentioning the very good room upkeep. We also have our own toilet and shower, and a nice sitting area that overlooks the misty mountains and the cemetery with its many five elements pagodas, reminding me that the human form is composed of water, fire, earth (metal), wind (air) and spirit…..